This news comes as no surprise to many people. Constantly having to check for new messages is an addiction and can ruin relationships. Did someone see Captain Obvious fly by? These little pieces of technology have made slaves of people and feed the narcissism of people in nations world wide. One only has to look away from their own phone to the people around them. They will see the eyes of almost everyone fixated with the 3 1/2″ plus screen in their hands. The need to feed their addiction of being “connected” is coming at a cost of creating real relationships. Its no wonder people are choosing to take vacations where there is no cellular service. The idea of unplugging is being embraced by adults but not as much by the younger generations. Children today are growing up in a world where there has always been an Internet and everyone has always been “connected”. They can communicate instantly with someone across the globe as easily as they could with someone across the table. However, they and most other people are not looking away from their mobile devices enough to know someone is sitting across the table or right next to them. Interestingly enough, one of the “hit” shows today is about what would happen if suddenly all the power in the world went out. Revolution takes a journey to possible future without the conveniences of electricity and the hyper-connected society we are currently involved. On one had society needs electricity for things like medicine and food. On the other, unplugging from technology isn’t such a bad thing. Approval addiction is on a whole new level when people have feelings similar to “the “phantom limb” syndrome suffered by amputees.” It’s time people start letting go of their digital masters and reclaim their lives. Oprah is not only a well know person but a well known brand. When someone is a brand beyond their personal identity any mistake, large or small, has a much larger impact. 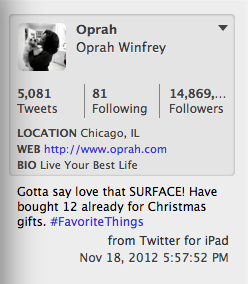 In the case of a mis-Tweet, Oprah is going to have quite a bit of damage control to do with Microsoft. While she appears to be a fan of the new Microsoft Surface tablet, she, or someone managing her Twitter account, was not paying attention and posted her love of it via their iPad. Oops! Of course this is error in judgement is going viral around the globe. Let this be a note to celebrities, when endorsing a product, be sure you are not doing it from a competitor’s product. Especially when you are a “rep” for one of the companies. Apps are the bread and butter of the smartphone world. With out them, they’re pretty much just a more expensive feature phone. When someone gets a smart phone for the first time they go “app” crazy. Downloading this app and that app just because they can. It’s fun and new. Once the “app” euphoria subsides, the unused ones are generally deleted, leaving people with the most used on their phone. I was no different. What I have on my phone are the most useful apps for me. Honestly I don’t have any games on my phone. I’m somewhat utilitarian on how I use it. What I do have an use I highly recommend. And so I thought this would be a great platform to continue my recommendation of apps. Starting next week I will being a series on smart phone apps I recommend. I want to preface I am not an iPhone user, and more than likely will never be. I am a happy Android user and am not even on the latest version of the operating system. I also have a tablet but do not use it quite as much as my phone. And yes, I do have a game or two on it. Solitaire anyone? I hope the series is a useful and helpful one. I look forward to the feedback and opinions!